Users can manually transfer inventory from one location to another. An efficient way to move inventory from location to location is by using RF. 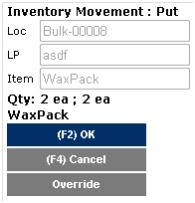 This section describes the ways that movement of inventory within the warehouse can be initiated by the user. Standard movements can also be used to change inventory status of inventory. If inventory is being changed from a good status to a not good status, Warehouse Management then makes the inventory not available. If inventory is completely reserved, the reservation must be removed by the system or the status change will actually fail due to unavailable inventory. 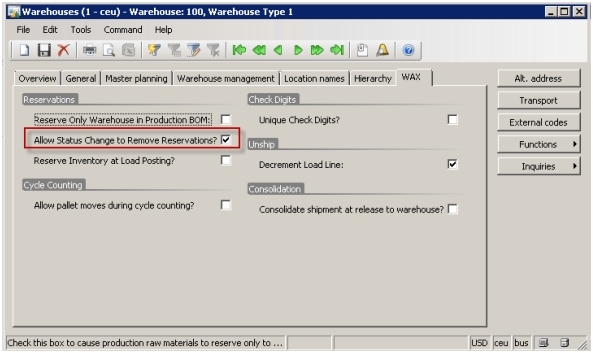 Warehouse Management has reservation removal configuration, described below. In certain cases, a warehouse transaction will decrease the overall quantity available of an item. This includes adjustments out and inventory status changes. In these cases, if an item is fully reserved, the reservation must be removed first or the transaction will fail. 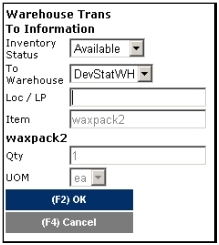 A configuration at the warehouse allows the system to remove reservations during status change. When this check is enable, the system will go out and attempt to remove enough reservations to change the status of the entire quantity. It may have to remove reservations from multiple transactions. When looking for transactions to remove reservations from, Warehouse Management looks in date descending order, starting with the oldest date first. When a reservation is removed it is tracked by the system. This form is found on the Warehouse Management/Inquiries/History/Reservation Removal History. Warehouse transfers are very similar to standard movements except they used to transfer inventory to a different warehouse. This is done by providing a warehouse dropdown box on the movement to screen (see below). An RF movement by template involves a user choosing which location to transfer inventory from and Warehouse Management choosing which location to transfer the inventory to. Warehouse Management uses ‘Inventory Movement’ Location Directives to establish the final inventory location. Users can manually adjust inventory into and out of a location. This part shows how a user can adjust inventory by using RF. 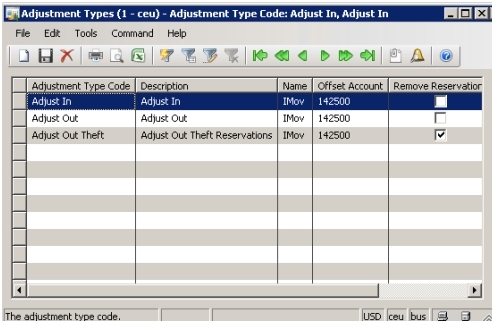 Adjustment types need to be configured. This setup form is found on Warehouse Management/ Setup/ Inventory/ Adjustment Types. This form allows to configure which movement journal is used for each adjustment type, and also optionally overrides the offset account. For adjustments out, if the remove reservations checkbox is checked, the system is allowed to remove reservations. A default adjustment type should be selected on the Warehouse Management parameters as well. This will default the adjustment type on the RF. Note that the adjustment type on the RF Menu Item setup will override the global parameter. The RF menu item must be configured for adjustment in. Adjustment in is a fairly simple transaction. Identify the location/license plate, item, quantity, UOM, and status of the inventory to be adjusted in. An adjustment type must also be selected, unless the user wants to use the default. The RF menu item must be configured for adjustment out. Adjustment out is also a fairly simple transaction. Identify the location/license plate, item, quantity, UOM, and status of the inventory to be adjusted out. An adjustment type must also be selected, unless the user wants to use the default.